Description: Located in a large, multi-use park. Consists of mostly holes between 250 ft and 300 ft. Elevation is an almost constant feature here; 6 of 9 holes feature at least a 10ft elevation change. The course makes use of the unique topography in the area with several small hills and boulders coming into play. The course is pretty easy to follow with bricks underneath the baskets pointing in the direction of trails. There is only one semi-long walk. 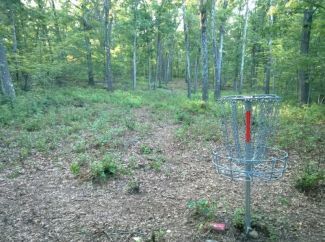 After hole 3, follow the foot path from the basket to the main trail. Take a left onto the main trail and walk for about 150 yards. The path for hole 4 is on the left. Local Directions: From the North: Take Route 1 South to Route 106. Turn right at George Street onto Messenger Street. Messenger Street becomes Elmwood Street. The park entrance will be on your right. From the South: Take Route 1 North to Elmwood Street. Travel about 3/4 mile. The entrance for the park will be on your right. To get to the course, park in the Petti Field parking lot. Walk 400ft up the road you just drove down to get to the parking lot. Take a right at the fork and follow the road another 250ft. Between sites 7 & 9 there is a path on the right. Follow this path down the hill. This path will intersect another path. Take a left and continue down the hill. At the intersection with the next trail, take another left. The path for the first tee is about 40ft ahead on the right (leading up hill).